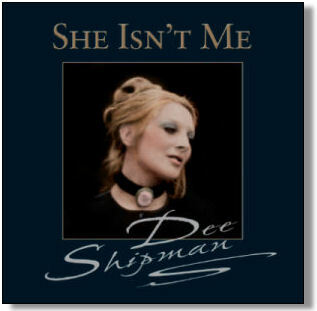 Noted lyricst Dee Shipman who has written West End musicals with Charles Aznavour ('Lautrec') and Petula Clark ('Someone Like You') recorded this unreleased collection of songs in October 1970 at Chappell Studios, London, with all arrangements and musical direction by Roger Webb, it was produced by Norman Newell. This album concludes with 'She Isn't Me', a new recording from the Dee Shipman / Roger Webb musical 'Emma' based on the life of Lady Emma Hamilton. Dee Shipman is perhaps best known as a lyricist and her collaborations with Charles Aznavour (Lautrec) and Petula Clark (Someone Like You). In fact she began her career with her feet very much on the stage and in 1970 she created 'She Isn't Me' produced by the legendary Norman Newell, only to remain unreleased. Whilst this oversight is never really explained - Shipman herself refers to this CD release as a resurrection rather than a release - this is much to value in the quality of this recording. There are some lush, even idiosyncratic arrangements that ooze a seventies louche glamour, particularly 'The Way You Look Tonight' and a Cy Coleman standard 'The Best Is Yet To Come', that would not seem out of place in an Austin Powers movie. Shipman gives a particularly touching rendition of 'One Hand, One Heart', the Bernstein / Sondheim standard that here retains the childlike innocence intended by the composer. 'What Is A Youth' is something of a surprise, perhaps best known as the theme song for Simon Bates' Our Tune, it is originally from Zeffirelli's 'Romeo And Juliet' with poignant poetic lyrics by Eugene Walter. The title of the album comes from a taster of Shipman's latest work, a duet with Sadie Nine called 'She Isn't Me' and taken from the musical 'Emma', a collaboration with Roger Webb, based on the life of Emma Hamilton. As a bonus track it does little to enhance the album and only serves to highlight the clarity, texture and sheer magic of Newell's earlier recordings.